The soldiers of the Waffen-SS were also the first to utilize the camouflage battle dress that was to later become so common. But in one field, that of internal personnel organization, the Waffen-SS has yet to be imitated much less surpassed. 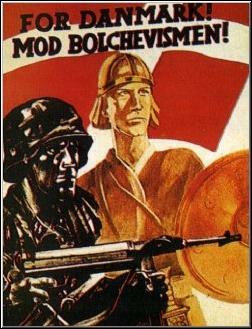 The Waffen-SS was probably the most "democratic" armed force in modern times. Rigid formality and class structure between officers and other ranks was strictly forbidden. An officer held down his position only because he had proven himself a better soldier than his men, not because of any rank in society, family connections or superior academic education. In sports -- one of the vital cogs in the Waffen-SS training programs -- officers and men competed as equals in an atmosphere that sponsored team work and mutual respect and reliance. Non-German volunteers of whatever nationality were not regarded as inferiors; they were judged on their ability and performance as soldiers. For many there was additional incentive. In Belgium, Holland and France, scores of populist and right-wing political figures had been arrested, incarcerated and beaten, and shot-out-of-hand. The most famous single incident occurred in Abbeville, France in May 1940, when French police lined up 22 leading Belgian right-wing leaders and executed them in a public park shortly before the arrival of the Germans. It was certainly a "war crime" -- one of the first in fact to be committed and documented in World War II -- but try to find it in a history text book! The establishment historians have shied away from any discussion of this event. Following this massacre, many of the followers of the victims flocked to join the new volunteer regiments of the Waffen-SS. Volunteer Legion Flandern: This was initially a 900 man battalion later increased to 1,116 men that served around Lake Ilmen under the 2nd SS Brigade and at times with the 4th SS Police Division and the Spanish "Blue" Division. It acquitted itself splendidly, obtaining mention in the Wehrmacht war bulletin among other honors. Its supreme moment came in March 1943 when it recovered a lost regimental frontline sector from the Soviets in a bold attack and held onto the regained positions for a week against all odds. By the end of the engagement the "Legion Flandern" had been reduced to a net strength of 45 men! Equal numbers of Flemings served with the 5th SS Division "Wiking" and the Volunteer Regiment "Nordwest." Eventually these contingents were merged with new recruits to form the Storm Brigade "Langemarck." Volunteer Legion Niederlande: This was a 2,600 man regiment and component of the 2nd SS Brigade on the Leningrad front. "Niederlande" swiftly obtained a reputation for valor and achievement. In June 1942, Legionaires succeeded in capturing the commander of the 11th Soviet Army and 3,500 of his soldiers. One enlisted man, Sturmann Gerardus Mooyman, became the first West European volunteer to receive the Knight's Cross decoration after singlehandedly destroying 14 Soviet tanks in one day in February 1943. 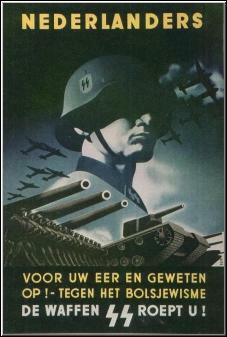 The Legion later formed the basis for the "Nederland" Brigade and division. Finnish Volunteer Battalion of the Waffen-SS: This was a 1,000 man unit that served as a component part of the "Nordland" Regiment of the SS "Wiking" Division. Its greatest moment came in October 1942, when the Finns were able to seize Hill 711 near Malgobek in the south Caucausus in a daring frontal assault. Other German units had repeatedly tried to do the same thing but had failed. The Finns served in the Waffen-SS at the discretion of their government, which in June 1943 thought it would be more discreet to transfer the Battalion from the Waffen-SS to the Finnish Army. Legion Wallonie: This was organized as a mountain-infantry battalion. It was formed by the SS from the French-speaking Belgians (Walloons) and was taken over by the Wehrmacht in late 1941 so as not to offend the "Germanic" Flemings already serving in the Waffen-SS. It fought exceptionally well in the campaign through the Caucausus Mountains alongside the SS Division "Wiking." It contained many former Belgian Army Officers and the famous political leader Leon Degrelle, who exhibited a flare for death-defying heroics. It was finally re-transferred back into the Waffen-SS in June 1943 at Degrelle's request and was reformed as an assault brigade. Spanish Legion: This was the independent 250th Infantry Division of the "Spanish Blue" Division that fought with incredible heroism on the Lake Ilmen Front. After it was withdrawn from the eastern front in August 1943 by Franco, survivors carried on in a Spanish SS Legion that fought until the end of the war. The 27 year old Danish Army Lieutenant Per Sorensen (formerly Adjutant of the Viborg Battalion) was the ideal model of what the Germans were looking for when they launched the Legionary Movement. 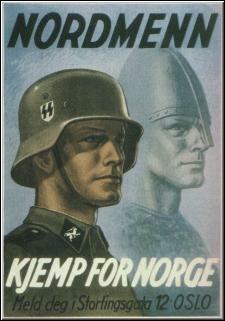 On 1 July 1941, Sorensen volunteered for service with the "Freikorps Danmark" motivated by anti-communist feelings and a vague sort of National Socialist attitude. In the autumn months he attended the Waffen-SS Officer School at Bad Toelz and in the spring of 1942 rejoined the "Freikorps" as commander of the 1st Company. To his soldiers, Sorensen had the uncanny habit of attracting the enemy. They passed around the phrase: "Wherever Sorensen is -- the Russians will come!" And they usually were right. For his endless solicitude and patience, he received the nickname "På Sorensen" from his men. Time and time again, Sorensen provided the special qualities so vital in a leader. In January 1944, he took over an entrapped battalion near Vitino in northern Russia and literally led it to safety by staying at the point of the column on a journey through thick, snow shrouded forests. After commanding battalions and battlegroups, Sorensen received command of the 24th SS Regiment "Danmark" just to the east of Berlin in April 1945. Finally, the Regiment was reduced to trying to defend a street-car station in the heart of Berlin. While climbing a telephone pole to try and survey the terrain, Sturmbannführer (Major) Sorensen was picked off by an enemy sniper. On the next day, in the midst of the desperate, last battle for the German capital, Sorensen was given a military funeral in the Ploetzensee cemetery by Germans and Danes from the "Nordland" Division. We are standing here by the graveside to take our last departure from a courageous Danish comrade, the foremost officer and leader of the Regiment "Danmark": Per Sorensen! I must, even in this hour give the thanks of my people for you and your many Danish comrades who have stood so loyally beside us. I would like to express from my heart: may you find peace at last in our bleeding city!